Neurodegenerative diseases are progressive and multifaceted illnesses. For example, amyotrophic lateral sclerosis (ALS) and frontotemporal dementia (FTD) differ in their clinical presentation and affect distinct sets of nerve cells. However, in terms of their biological origins, the two conditions appear to have much in common. The goal of Dorothee Dormann’s work is to identify these common factors and understand their functional significance. As a biochemist – and leader of an independent Emmy Noether research group at LMU’s Institute of Cell Biology since 2014 – Dormann seeks to uncover the molecular mechanisms that lead to the loss of nerve cells (‘neurons’) in the two disorders. 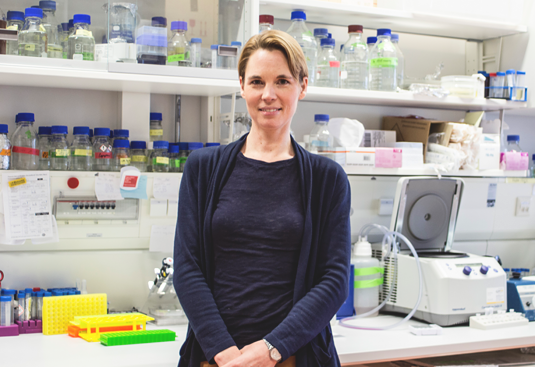 Her studies have shown that in both ALS and FTD patients, the transport of certain proteins from the cell cytoplasm into the nucleus is disturbed, and that this functional breakdown is responsible for the accumulation of characteristic protein aggregates in the cytosol of the dying neurons. For this work, Dormann received the Heinz Maier-Leibniz Prize – one of the most prestigious awards open to early-career researchers in Germany. “These discoveries pinpoint one of the central mechanisms that is common to both diseases. And there are indications that the regulation of protein trafficking between cytoplasm and nucleus is probably an important component of other neurodegenerative diseases, such as Alzheimer’s disease and Huntington’s disease, as well,” Dormann explains. In March 2019 she will be presented with the internationally renowned Paul Ehrlich and Ludwig Darmstaedter Prize for Young Researchers. In the case of ALS, the motor neurons that control voluntary movements of the musculature are gradually lost. This leads to progressive muscle weakness, and ultimately to the lethal paralysis of the respiratory musculature. FTD is the second most common form of dementia (after Alzheimer’s disease) in people over the age of 65. The condition is characterized by a massive loss of neurons in the frontal and temporal lobes of the brain, which mainly become manifest in drastic alterations in the patient’s personality or language skills and comprehension. Both illnesses are currently incurable, and lead to death within a few years of diagnosis in the majority of cases. In a small percentage of patients, these diseases can be linked to specific genetic mutations. Such inherited forms of disease are of particular value for researchers, because studying the gene mutations can provide invaluable insights into the fundamental cellular processes affected by the mutation. “We believe that these biochemical pathways are also perturbed in patients in which the relevant gene is intact, and that this can help us to understand the origin of the sporadic, non-inherited cases,” Dormann explains. Dormann started to investigate the molecular basis of ALS and FTD during her postdoctoral fellowship in the lab of Christian Haass. She had joined his lab in 2007, right after the recognition that two particular proteins are common to the abnormal protein deposits in the nerve cells of ALS and FTD patients. “And the topic has fascinated me ever since,” she says. Dormann hopes that her research will make it possible to develop new approaches to the effective treatment of neurodegenerative diseases. “We are not there yet, but our basic aim is to identify central molecular targets that would enable us to tackle the real causes of these conditions.” Her research in a new DFG Priority Program devoted to phase separation in cells, which was jointly initiated by Dormann and colleagues from Mainz, Dresden and Heidelberg and will get underway in the spring of 2019, might bring her a little closer towards this goal.